Canada tries to produce films that are artistic and with a difference as compared to Hollywood Films which makes it difficult for the Canadian film industry to compete on the same footing with Hollywood, feel Canadian Directors Ms. Andrea Dorfman and Mr. Mathieu Denis, whose films are being screened at the 45th IFFI. 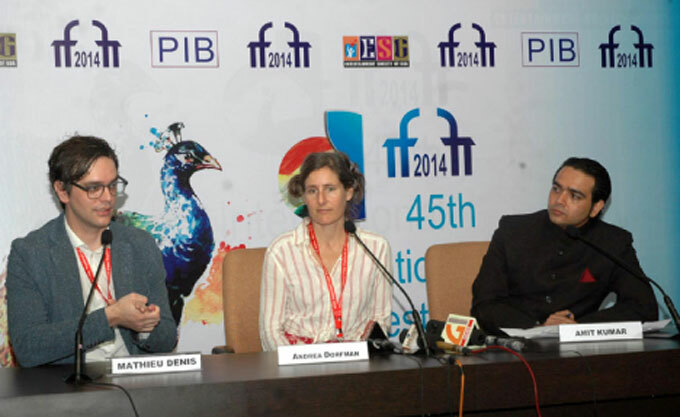 They were speaking to the press at the media center of IFFI, 2014 on November 28. Canadian film makers rarely recover their investment but complete support by the government helps them to produce good films and stay in business, says Mathieu Denis, whose feature film Corbo has been selected for the International Competition category at the IFFI,2014. The film is a depiction of the movement for separation of Quebec from Canada and the banned organization FLQ and dates back to 1966. It was only after I started the film, I realized how difficult it is to shoot a ‘period’ film, the director explains. Finding the right costumes, hairdos, location etc which resemble that era can be quite a challenge since everything has changed tremendously, he adds. The theme has been popular in Quebec cinema as the people of the province have been struggling for their identity since the 1960s, he feels. Ms. Andrea Dorfman agreed with Mathieu that identity struggle is a common feature for entire Canada since it is a country of immigrants in which different communities strive to establish their individual entities. Her film ‘Heartbeat’ reflects the inner struggle of a woman who is unhappy with her current life and nurtures a dream to become a musician. The challenge lies in expressing an internal story on screen, for which she also took the help of animation. Indian films are yet to launch themselves commercially in Canada; they feel although they are popular in Toronto area due to a large Indian population there.